You have an image in your head of the look on your child’s face, the squeals of glee at the surprise gift of an adorable puppy or kitten, big bow around their neck, licking the faces of the whole family. Everyone is laughing and delighted by the new addition to the family. Unfortunately, this is not always the way it pans out and a surprise gift of a pet can go very, very wrong. 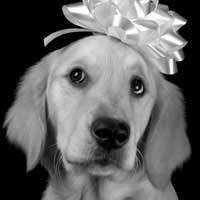 Here are some things to consider before giving an animal to your child as a gift. Does your child really, truly want a pet? Often, what parents see from their children is a natural reaction to being around something furry and adorable. But just because kids love stuffed animals or playing with the neighbour’s dog, doesn’t necessarily mean that they are ready to share their home with a full-grown animal for a number of years. And cute baby animals grow up quite quickly, so watch and see whether your child is merely responding to babies and not adult animals. If their response is to all things cute and fuzzy, it’s best to hold off on gift giving. Is the pet your child wants feasible with your lifestyle? Taking an animal into your home should not be a spontaneous decision, but rather one to be thought through carefully. Having to take an unsuitable pet to a shelter after a few weeks because it doesn’t fit with your family’s lifestyle can be pretty heartbreaking for all concerned, especially the child you gave it to. Assess factors like cost, the type of pet to get, amount of room in your home, time you have to spend each day, whether you can take care of the animal if your child is unable to, whether your family travels much, and so on. Do some research and reading so you can make an informed decision. Then you will have made a responsible choice. Are they allergic? If your child has never actually been around animals before, it is best to determine whether they can have a pet before giving one. Arrange for your child to do some visiting first with a person who has the type pet you’re thinking of, have them play with the animal at a pet store or take them to a shelter with you to ensure there is no allergic response. The gift of a stuffed up nose, swollen eyes and taking cute little Spot back isn’t exactly the present you have in mind to give. If you determine that your child does indeed want an animal as part of his or her life, get the whole family involved in the decision making process. After all, this pet will be a part of everyone’s life for quite a while to come. One of the best ways to give a pet as a present but still let everyone have a hand in the actual choosing of the animal is to make a pet gift-giving basket. Buy a stuffed toy of the type of pet you think your child will want, tie a gift certificate to its neck from a shelter or pet store and include a kid’s book on pet care. Then the whole family can take as many visits as they need to choose a pet that everyone bonds with. This is an especially good idea for the busy holiday season when there may not be enough time to look after the needs and training of a new pet anyway. Now you are ready to give the gift of a living being to your child, in a way that will make the whole family happy. Or possibly this article has changed your mind and you have made a very responsible, well thought out choice that will save your child the sadness of having to give up a pet it was not possible to have.